Small, sub-surface cracks have been found in three more Southwest Airlines planes like those thought to have caused another to develop a hole in its cabin roof mid-flight, officials say. The National Transportation Safety Board said it had been informed there were additional crack indications in the lap joints on the Boeing 737-300s. Nineteen other 737-300s showed no problems and will return to service. The plane with the ruptured fuselage landed safely in Arizona on Friday. Some of the 118 people on board the flight, which had just taken off from Phoenix, reported hearing a loud bang as a 1.5m-long gash appeared. The hole caused a sudden drop in cabin pressure, forcing pilots to make a controlled descent from 10,485m (34,400ft) to a military base. No-one was seriously injured, though a flight attendant was slightly hurt. On Sunday, a section of the 737-300's ruptured fuselage was removed and sent to NTSB headquarters in Washington for in-depth analysis. NTSB investigators also conducted inspections of other portions of the lap joint along the fuselage and found evidence of additional cracks. Later, the federal agency said in a statement that it had been informed by Southwest that "crack indications in the lap joints have been identified on three airplanes they have inspected". Southwest cancelled 600 flights over the weekend to allow engineers to carry out a special test developed by Boeing on 79 of its aircraft. Tests on the 57 remaining jets are expected to be completed by Tuesday evening. Further flight cancellations are likely until all are back in the air. The NTSB said Boeing would be drafting a "service bulletin" to describe the inspection techniques that they would recommend carrying out on similar planes with comparable flight cycles (take-offs and landings) as the one involved in the accident over Arizona, which was 15 years old. There are 931 such models in service worldwide, 288 based in the US. "What we saw with Flight 812 was a new and unknown issue," said Mike Van de Ven, Southwest's executive vice-president and chief operating officer. "Prior to the event regarding Flight 812, we were in compliance with the FAA-mandated and Boeing-recommended structural inspection requirements for that aircraft," he added. "We regret any customer inconveniences as a result of the inspections currently under way. Delays and cancellations are never the preference, however we are taking every precaution we can to ensure that our operation is safe." 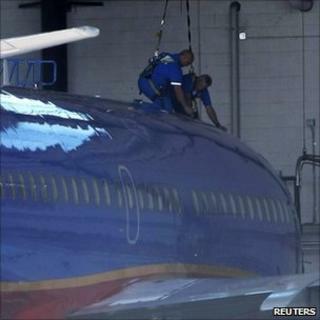 Southwest changed its maintenance programme after metal fatigue caused a similar accident on another of its jets in 2009. Before then, the airline paid millions of dollars to settle charges that it was skipping inspections. In 1988, cracks caused a hole to open in an Aloha Airlines plane over Hawaii. In that accident, a flight attendant died.